Brown teeth due to fluorosis. People from Naivasha are sometimes identified by the colour of their teeth. This arises from the high levels of fluoride in the water consumed by residents causing teeth to turn brown. However, the water around Naivasha has been found to contain as high as 12mg/l which is 25 times more than the level recommended by WHO. Here are the dangers of high exposure to fluoride. This is an irreversible condition caused by excessive exposure to fluoride that can lead to permanent damage to the teeth and bone formation. 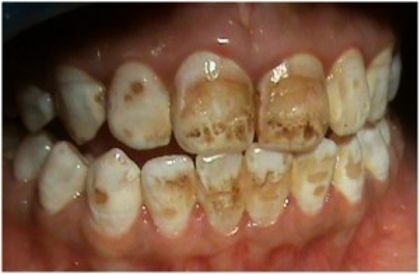 Dental fluorosis causes the change of the tooth’s enamel surface causing pitting and brown spots. Excessive exposure to fluoride has been found to cause calcification of cartilage tissue leading to skeletal fluorosis. Various studies have linked skeletal fluorosis to osteoarthritis condition which affects the knees. Fluoride is toxic to the pineal gland as it accumulates and calcifies the gland. The pineal gland is important as it regulates body rhythms and wake-sleep cycles. The pineal gland also plays a central role in the onset of puberty. Research has shown earlier onset of puberty in girls living in areas prone to more fluoride than girls in other areas less prone. It affects the thyroid gland. Fluoride exposure can lead to an autoimmune reaction to the thyroid gland. This can cause enzyme poisoning effect that can eventually extend to the genes and damage the chromosomes. The adverse effects of this range from abnormalities in newborn babies to cancer. High levels of Fluoride of over 3mg/l has been found to correspond with lower fertility rates. Tests done to animal models have shown that fluoride reduces reproductive hormones in females. In men, those suffering from fluorosis have lower testosterone and fertility than men with limited fluoride exposure. High levels of fluoride above the amounts recommended by the WHO are toxic to the kidney health. Higher rates of kidney diseases have been reported in areas with water containing high levels of fluoride. Levels fluoride as low as 2mg/l have also been found to cause renal damage in children according to Chinese researchers.